can as part of a Scouting project. While I am not opposed to safe practices, our society has become such a worshiper of safety and security that we have become slaves of our current corporatocracy. The Boy Scouts prohibition of handcrafting such simple alcohol stoves in just another example of this lunacy. This type of thinking is exactly the kind that ProvideYourOwn opposes. We want people, especially boys, to make their own stuff. While we don’t quite go as far as the tongue in cheek quip over at Make magazine – “poke your eye out”, we come pretty close. We don’t advocate avoiding risk, only unnecessary and foolish risks. We want people to become as self-sufficient as they choose to be. While we are not opposed to corporations in general, we do not want to be their slaves either, but rather their masters. They only way we see to do that is to become independent of them. 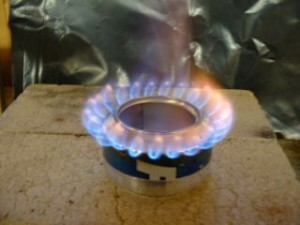 Making our own camping stoves from a free soda can is by far preferred to being forced to buy some safe, government-certified, expensive stove made by a corporation. Are Boy Scouts Anti-Makers? by Provide Your Own is licensed under a Creative Commons Attribution-ShareAlike 4.0 International License. This entry was posted in Living, Skills and tagged opinion, safety. Section: Blog. Bookmark the permalink. Both comments and trackbacks are currently closed. A fantastic cup of coffee is the only thing that could make this blog better. I think these old wine lovers would enjoy your post. This was truly remarkable. I really like what you did with the curtains. You sure know how to make a squirrel smile. Where do you buy all your hardware? Can LED Lighting Cause Blindess? The content of Provide Your Own is licensed under the . See Terms for more information. All content posted on this site is commentary or opinion and is protected under Free Speech. ProvideYourOwn is not responsible for content written by contributing authors. The information on this site is provided for educational and entertainment purposes only. It is not intended as a substitute for professional advice of any kind. ProvideYourOwn assumes no responsibility for the use or misuse of this material. Your use of this website indicates your agreement to these terms and those published here. All trademarks, registered trademarks and servicemarks mentioned on this site are the property of their respective owners.